With more than 170 compounds from 127 companies in clinical development, the CNS sector has a diverse pipeline of new chemical entities and biologicals, as well as novel formulations and new indications for approved drugs in lifecycle development. While the pharmaceutical industry can expect losses from major CNS products facing generic competition over the next few years, significant unmet clinical need and rising patient numbers are likely to fuel the market for novel products for years to come. According to a new Espicom report, CNS Pipeline Fact Book 2012: What’s in Clinical Development, more than 270 agents are currently in Phases I, II or III clinical development for CNS indications. 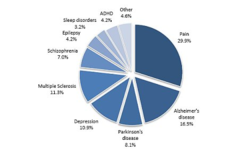 Around 37% of these are being developed for neurodegenerative conditions, particularly Alzheimer’s, which is the most common form of dementia. As progressively debilitating conditions, Parkinson’s disease and multiple sclerosis also fall into the neurodegenerative category. Another 30% of agents are being developed for pain indications; an area where the challenges faced by developers include difficult to treat conditions such as breakthrough cancer pain and neuropathic pain, as well as the need to tackle prescription drug abuse, which has reached epidemic proportions in the US. Numerous companies are involved in CNS R&D, from small biotech companies focused on a single project to big pharma. Unsurprisingly, the vast majority of projects in the early clinical phases of development are being undertaken by biotech companies as big pharma continues to move away from costly R&D investment. Among the big pharma companies actively involved in the development of potential new therapies for CNS conditions, Pfizer is the most active, with direct involvement in 20 projects in clinical trials. Other major companies active in this area include GlaxoSmithKline, AstraZeneca, Biogen Idec, Sanofi, Merck & Co and Eli Lilly. However, fewer than 20 companies have five or more agents in clinical development for CNS conditions. Over the last few years, the CNS sector has been characterised by multi-billion dollar blockbuster therapies, including Eli Lilly’s Zyprexa (olanzapine) and Cymbalta (duloxetine), Pfizer’s Lyrica (pregabalin) and Celebrex (celecoxib), AstraZeneca’s Seroquel (quetiapine fumarate), Teva’s Copaxone (glatiramer) and Bristol-Myers Squibb/Otsuka’s Abilify (aripiprazole). As their patents expire over the next few years, companies will face significant revenue losses. But with rising numbers of patients and significant unmet clinical need, there is a continued need for improved therapies in this sector. Espicom Business Intelligence is a leading provider of medical and pharmaceutical market analysis. With more than 50,000 users worldwide its reports, news services and analysis products are used regularly by key decision makers in industry, government and commerce. A full catalogue can be found on the web at http://www.espicom.com.